In July 2014, pharmacy Nan-Hui Jo, site a single Korean mother and survivor of domestic violence, doctor was separated from her six year old daughter, Vitz Da, and arrested on claims of child abduction. In 2009, Nan-Hui fled to Korea with Vitz Da to escape physical and emotional abuse by her then-partner and father of the child, a combat veteran of the Iraq War with PTSD and anger issues. Using a common manipulation tactic to control a partner’s attempts to regain independence, her former partner retaliated by reporting Nan-Hui for child abduction. Last July, when Nan-Hui arrived with her daughter to Hawaii, she was handcuffed, arrested, and immediately separated from her daughter. Nan-Hui has not seen her daughter in over seven months. Nan-Hui’s former partner has publicly testified about his repeated violence against her confirming that on one occasion, he “grabbed her by the throat and threw her against the wall.” He has also, on two separate occasions, broken his hand while punching the wall by her head, and again when punching the car’s steering wheel when she was in the car with him. When Nan-Hui fled and attempted to rebuild her life, he “sent emails saying he was ‘considering spending thousands of dollars on a scary bounty hunter.’” These incidents of violence are only the public ones against Nan-Hui. Like many survivors of domestic violence, Nan-Hui was concerned that if he had hurt her, that he would hurt the child. According to a study funded by the U.S. Department of Justice, 30 to 60% of perpetrators of intimate partner violence also abuse children in the household. As advocates for survivors of domestic violence, we know that domestic violence thrives behind closed doors, away from the eyes and ears of the public. Domestic violence is not just physical violence; it often involves “coercive control, economic abuse, emotional abuse, and/or sexual violence. It is intended to gain or maintain power and control over a romantic or intimate partner to intimidate, frighten, terrorize, humiliate, blame, or injure”. Nan-Hui’s former partner’s behavior and patterns of violence fit well into the prototypes of abusive partners, using different forms of power to control, manipulate, and smear their partners. Conflict in relationships is normal. Punching walls and hitting steering wheels to intimidate your partner, strangling your partner and throwing her against the wall, and threatening to use a bounty hunter is a pattern of abuse and violent behavior. Five months after being arrested, Nan-Hui was tried on December 15, 2014, for “child abduction.” This trial resulted in a hung jury. The District Attorney, Steve Mount, however, pursued a retrial, refusing to acknowledge the importance of domestic violence in Nan-Hui’s case and instead, has used all resources available to prosecute her. Instead of being granted protection, survivors of domestic violence are often criminalized: the ACLU reports that of all incarcerated women in the United States, 85-90% have a history of domestic and sexual abuse. Survivors of domestic violence should not be punished for defending themselves, protecting their children, and rebuilding their lives from the violence of an abuser. Nan-Hui has been in jail since the arrest without due process, has now been separated from Vitz Da for over seven months, and has now been convicted of “child abduction.” These punitive measures show little concern for the welfare of either child or mother. Nan-Hui and her daughter have an incredibly close and caring relationship, and to Nan-Hui, Vitz Da is her whole world. After a stillbirth earlier in her life, Nan-Hui was told that she would never be able to conceive again. When she was pregnant, she considered her daughter a miracle. Giving grace to the birth of her daughter, Nan-Hui named her her Vitz Da, meaning “all light in Korean”. Vitz Da, who was fully immersed into Korean society for most of her life, has been abruptly disallowed any contact with her mother. Vitz Da is currently in full custody of the father, and Nan-Hui has not been able to speak with her daughter since July. Nan Hui’s retrial has ended and she has been convicted of “child abduction.” The sentencing hearing was initially to take place on April 1, 2015. The sentencing date has now been moved to April 28th at 1:30PM. We have been notified that there is an immigration hold on Nan-Hui Jo so after sentencing, immediate deportation proceedings could take effect which would separate Nan-Hui from her daughter permanently. CBP and ICE have the power of prosecutorial discretion to drop the hold on Nan-Hui so she can stay in the US to attend future custody hearings. We are deeply disturbed at how aggressively the Yolo County District Attorney’s Office, CBP (Customs & Border Protection), and ICE(Immigration & Customs Enforcement) is working to prosecute, criminalize and deport a single immigrant mother and survivor of domestic violence. 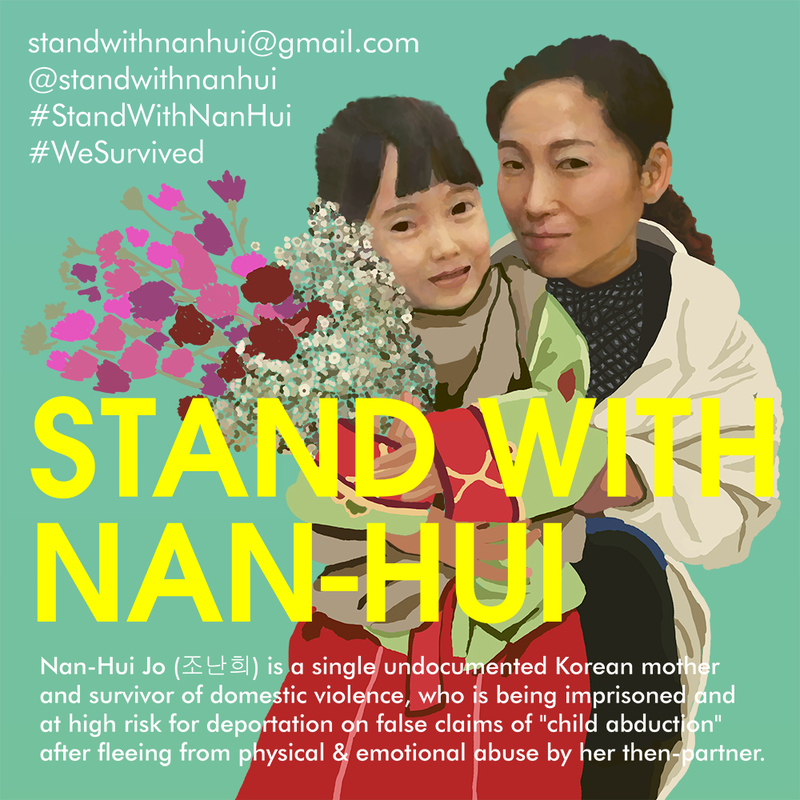 Stand with us in supporting Nan-Hui and demand justice for all survivors of domestic violence. Sign the new petition, share her story, and send a strong message to CBO, ICE, Yolo County, and our Congressional leaders that survivors of domestic violence must be supported, not criminalized and keep mother and child together! CBP and ICE, exercise prosecutorial discretion and drop the immigration hold on Nan-Hui! No deportation! Free Nan-Hui Jo and reunite her with her daughter! End the criminalization of survivors! we are deeply concerned by the Yolo County District Attorney’s Office for pursuing a retrial of Nan-Hui Jo. Nan-Hui Jo is a mother of a six-year-old child who was charged with child abduction. In 2009, Nan-Hui Jo fled with her child to her home country, South Korea, to escape the physical and emotional abuse of her then-partner and father of the child. After Nan-Hui left her partner, however, he reported it as kidnapping, a common tactic used by abusers. Upon returning to the U.S., Nan-Hui was arrested. Nan-Hui has been in jail since July 2014, and has been separated from her child for over six months. The child is currently in custody of the father, which we find extremely troubling. We are deeply concerned that Nan-Hui was prosecuted in the first place. Moreover, Nan-Hui was tried on December 15, 2014, with a resulting hung jury; yet the District Attorney is pursuing a retrial set for next week. The greatest tragedy and injustice is that the child has been separated from her own mother who went to great lengths to protect her; and their separation continues due to the actions of the District Attorney. We demand the District Attorney put this matter to a rest and not pursue a retrial so that Nan-Hui can reunite with her child immediately. We are extremely troubled at the length of the process and how aggressively the District Attorney’s Office is working to prosecute Nan-Hui, criminalizing a survivor of domestic violence. Many of us who work with survivors of domestic violence and sexual assault will be watching closely. We truly hope Yolo County District Attorney Jeff Reisig will do the right thing. Domestic violence is not a private matter. We are all impacted by domestic violence. We support the Yolo and Sacramento Korean American Community in their work to bring justice for Nan-Hui Jo. We ask the broader Sacramento community and beyond to join us to ask the District Attorney Office to free Nan-Hui Jo now so that she can reunite with her child. If your organization would like to sign onto this statement, please email info@kaceda.org.